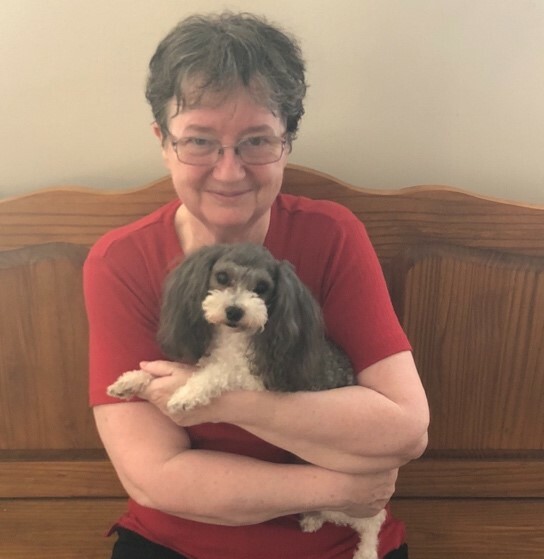 My name is Geraldine (Gerri) McEvoy, I live in K-W (the city where Octoberfest happens in October each year) Ontario, Canada, with my medical alert service dog Shiloh. I am sure this addition to Cookie’s faces will come as a great shock, to you Cookie and many others. I’m a mother to two adults boys – (both showing signs of AS – both not diagnosed – to them if they are not diagnosed – they don’t have it) (Chris) he and his wife (Shannon), are parents to my grandchildren – Emily and Adam) & Jason and his wife (Natasha), have no children, yet. I have a severe Auditory Processing Disorder – Hyperacusis/Misophonia (this has caused me to be an introvert), along with severe anaphylaxis allergy to sulfites – many other allergies – Hereditary Fructose Intolerance (HFI) – then in 2009 finally a diagnoses of Ankylosing Spondylitis, and in 2015 the diagnoses of Psoriatic Arthritis and Psoriasis, has made my life a living hell. Over the years I been also diagnosed with Celiac/Gluten intolerant (2004) – Severe sleep Apnea (2004) (controlled) & Central Apnea (Shiloh he monitors and alerts me to a central apnea) -Diabetic (Controlled by diet) – Hiatus Hernia – Diverticulum on small intestine – small amount of fluid, in the Pericardial sac around the heart – Narrowing airway/Bronchial asthma/lung damage (2 area of scar tissue – one close to heart) – GERDs (with inflammation) – IBS (NASH, other liver damage health issues- believed caused by HFI) – Osteoporosis/Osteopenia (lumbar spine) – Sjogrens [Arthritis(s)-(Osteoarthritis (both shoulders – Bursitis (hips) – Fibromyalgia – Rotator cuff tendinitis (both shoulders) -– Sacroiliitis – HLA B27+ – Vitiligo – plantar fasciitis (severe photosensitive to UV (b)) – Costochondritis – Anti-dsDNA (104) – optical migraines – fractured left distal fibula and multitude of allergies. My life was and continues to be a struggle – I struggled to do well in school but never knew why everything was a challenge – but I persevered – teachers say I was a day dreamer – failed miserably doing languages – excelled in math and the sciences – I always thought I was partially deaf. In high school I taught myself and continued to do the same into college. In 2007 after many years of being out of school – I was finally diagnosed with Auditory Processing disorder – with Hyperacusis and misophonia. Well that explained my challenges in school. With all my hard work in school, by trade – I am an ‘Electronic/Computer repair technician – with programming and accounting’. I have been diagnosed with (HFI) 2016 – (not genetically diagnosed yet)– a genetic disorder that babies die from. Did this genetic disorder start my journey, of living a life, with a multitude of autoimmune diseases? Is this a case of which came first “the chicken or the egg”. I was born premature – had croup and pneumonia the first year of birth. All my life I had one ear infection after another (the cause of my auditory processing disorder), with constant tonsillitis, measles, chicken pox, flu, and colds. Still life went on. Growing up – I seemed to be a clumsy child – two left feet – extra table legs I had to kick. My ankles were always hurting, burning with pain – never said anything to anyone. Another time – I jumped a high jump a foot off of the ground and sprained my ankle. A fall here – there – everywhere – another sprain, to nurse. My ankles were always giving out. This started when I was about 7. At 15, I was always it seemed bouncing my head off of something, it seemed the ground was my favourite. This one time I rode a pony bare back to the road – coming back from the road – the pony took off running back to his mate – left me flying off backwards hitting my head on the ground. Another time – I was smashing my head off a fence post trying to get away from my brother who was trying to get the football away from me. At 15 – it was my first year of vitiligo on my back – I had a bad sun burn that year and a white mark appeared in the centre my back that has stayed white to this day – my first autoimmune disease. Over the years I continued to fall – sprain my ankles and problems with plantar fasciitis. Then in 1979, my 2nd child was coming and I had a puppy who wanted to play – I tried to shush him off of me – that crazy puppy then decided he needed to have a run – 9 month pregnant and chasing this Old English sheep dog up the road – then pain from hell – told my doctor at the time – he said once I had Jason the pain would go away – boy was he wrong. Well I didn’t complain – I lived with the pain in my back – hip – it was constant. Finally after many years of falls, then numbness in my arms – worsening pain in my back and neck – I approached my doctor and asked her to do the test for HLA B27 – to my surprise and definitely hers – it came back positive. As my health issues worsen – my ability to explain properly how bad I hurt went unnoticed. I went to a Rheumatologist who try to diagnose me with MS (even though the intern had stated – the report – dated – showed I had a complete workup and there was no MS) he still tried to diagnose me with MS. I had become frustrated with my inability to communicate properly – all I did was ask him if he looked at my xrays – he said there was no need. He knew from my explanation that I didn’t have AS – I hadn’t said anything. After that I had become even more frustrated I let him have it – finally I opened my mouth and I sorta told him he was an idiot and never went back to see him. He wrote a nasty report to my GP that stated that I didn’t have AS – that was 2007. It was because of my many other health issues I was able to obtain Disability – after dramatic struggle with my then doctor, to get her to fill out the papers – within three months of the papers being filed I was diagnosed disabled. In 2009 – I was referred to a top Rheumatologist in her field of practice – in the Lupus/Psoriatic department at Toronto Western Hospital – she listened – took xrays – called me a week later – diagnosing me with Ankylosing Spondylitis (as there was fusing happening there on my SI joints). Well I am still being seen by one of the Rheumatologist there – in 2015 I was diagnosed with Psoriatic Arthritis and psoriasis. As of the 5th of this month (February 2018) xray are now showing fusing in my neck. I cannot turn my head to the left and my ability to turn my head to the right is also becoming problematic. I am unable to have any medications, because of my severe anaphylactic allergy to sulfites – which is in all medications here Canada – even my epi-pen. Since my diagnoses of HFI and now with high cholesterol – I don’t eat (fruit – very little vegetables and as of last week had to start a low cholesterol diet – no calcium – allergies to corn, eggs, soya, wheat, sugar and lactose intolerant – my diet has become very limited) – I am having problems knowing what to eat. But my liver enzymes have improved, diabetes is controlled, lost a lot of weight, sleep apnea is normal, and my pain is mild to moderate. I have lived a life of drama – abuse – abandonment (by my siblings, mother and ex(s) – my father passed in 1997 (I miss him so much). Ankylosing Spondylitis was always part of my life – I never gave it a chance to consume my life or thought – as I had so much other stuff going on in my life. AS has caused lots of damage – but life continues to go on. Thank you Cookie for faces – I now have a family who care.